With Mother's Day a week away, I was giving some thought as to how stepmothers are viewed by society.The stereotypical image of a stepmom needs an update. 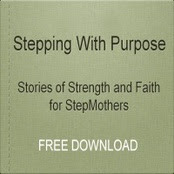 The term stepmom carries a negative connotation in some circumstances.Being a stepmom in some cases has the stereotypical image of "WICKED".Becoming a 2nd mom to someone elses children is not easy,but millions of women have taken on the task.Stepmothers need to be recognized and honored also.No one can take the place of the child's own mother ,of course. One of the things children face in blended families is being torn between 2 sets of parents.With this in mind, I have read and heard about "Step Mothers Day" being celebrated the Sunday after Mother's Day. This may be a good idea for some family situations. This week as a stepmom, do something nice for yourself . Pamper yourself, take a bubblebath,watch a movie, spend time with your spouse. Help your step children to honor their BM on Mother's Day if possible. A good way is by helping them with gifts. One year I helped my step daughter make a photo book for her mom with special things written in it by her. I took photos of my stepdaughter and let her pick out a book to put them in.It was fun for both of us and was also a very personalized gift for her mom. My hope is that as a stepmom you will have a very special day!Continuing The Journey!